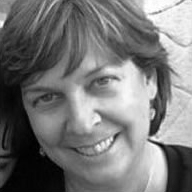 Emily Ferrara is the author of The Alchemy of Grief (Alchimia del dolore), winner of the Bordighera Poetry Prize, which was published in bilingual edition by Bordighera Press in 2007. She is featured, along with the book's translator Sabine Pascarelli, in the winter 2008 season of National Public Radio's The Poet and the Poem from the Library of Congress. She is an assistant professor of family medicine and community health at University of Massachusetts Medical School, where she teaches medical creative writing and doctor- patient communication skills. She has also has published and presented nationally and internationally on the power of writing to foster personal and professional development, and on creative writing as a form of reflective practice. what could cure my aging, worn-out eyes? of all I've seen, of all that is left to see. Last night, the sky was awash in the way of milk, swathed and swaddled stars in primordial velvet. The Dippers, Venus, even Pluto that sham planet. We ambled through quietude, my dog and I: muted streets, luminous houses, shadowy plots we'll revisit in daylight. Walking the neighborhood, we picked up a scent- pure and heady and vital- passed through mystery to gardens of night jasmine, honeysuckle, lifting on air. Hallucination, I thought. This could be bliss, reality superfluous. So much depends on a red wheelbarrow, rusting in the flummoxed moonlight. The scent persisted a block or two, what joy! The universe in its perfection-broken, boundless, ephemeral, without end. the Blaskets bask far in fog. beech, let loose from death. alder, oak, willow, ash, yew. from the fallen Tower of Babel. rectangular eye unblinking on the world.